Oviedo is maybe best known for being the city where Juan Antonio (Javier Bardem) takes Vicky and Cristina on an impromptu weekend getaway. The girls hadn’t heard of Oviedo before, so what is the city really like? I took a day trip here from my base in Avilés, just a 30 minute bus ride away. Much like Avilés, the architecture here is just so different, compared to Valencia! ...and seemingly very well kept-up. But it wasn’t just the cloudy skies; all of the buildings were a shade darker than in Valencia. The market has its own style, with a sea green roof and angular plan, much like the other buildings. Even the “ugly” new parts of town had a very distinct style. Perhaps the development of Valencia and Oviedo came about during different decades? Certainly one gets a good sense that Oviedo is rather hilly, and is surrounded by lush, green mountains. I also got a feeling of grandeur, with wide boulevards and ample parks to complement the narrower streets of the old town. 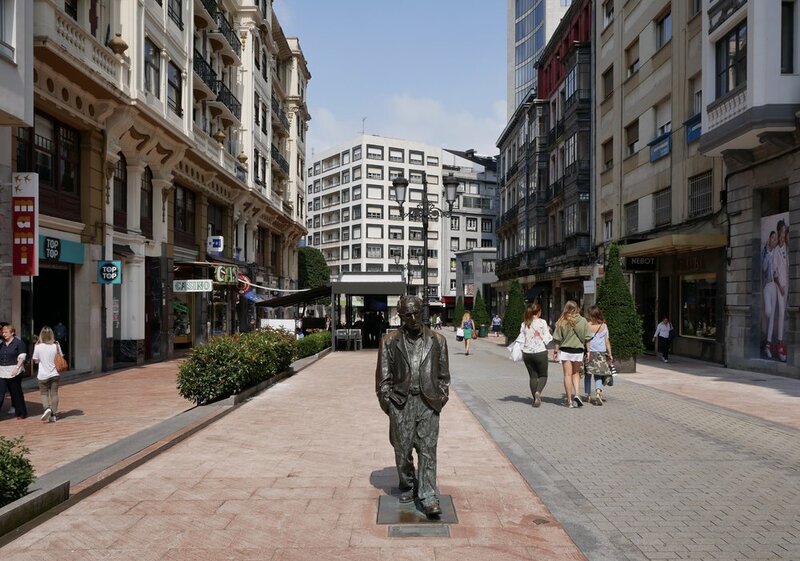 Oviedo is also known for having quite the collection of public sculptures. Here is a Dalí sculpture, which people call “Man on a Dolphin.” I thought it was a snail! Here’s Mafalda in that grand park, Campo de San Francisco. And of course, there’s the famous Woody Allen statue. I saw quite a few people getting their picture taken with him, despite the scandals in later years. People also often note that Oviedo is “Spain’s Cleanest City!” I maybe thought it was more of a “normal” city with regards to cleanliness, while cities like Valencia can be, unfortunately, particularly grimy. Oviedo turned out to be a pleasant place to walk around for about half a day, plus a visit to the free archaeological museum. I’m sure there’s more to see given more time, but I thought my time there was just right.